This Journey was my first time in India and I was very nervous because I had no idea what I had to suspect. The email contact with the Director of Tibet Charity Tsering Thundup and with Karen from Animal SOS Denmark was very helpful for my trip preperations. My arrival in Dehli was very easy because I had a very good helper, my Dehli Angel, a tibetan tourist guide, who organised everything for me. I arrived in McLeod Ganj at the 12th of september with the night bus early in the morning. Here Dolma Bhum, a staff of Tibet Charity was waiting for me and brought me to my hotel. The whole time I lived in this very nice room with a balcony and a great view. The hotel staff was very helpful and I had everything I needed. In the room next to me there lived Alison and Marja, two vets from the UK, so we befriended very fast. On Sunday the Director came to the hotel and received us very cordially. The first working day was the 14th of september, were we met the 4th vet, Liv from Norway and Bishan Das and Lobsang, our two dog catchers, nurses, drivers and guides during the whole time. The first week was characterised by got to know each other, the clinic and the way of working. But of course it did not take to long to be back in the veterinary daily routine, because the dogs are not considerate of the new arrivals. We had a few castrations in this week and also two emergencies, were two puppies got bitten by a big dog. One puppy recovered very well but the otherone had a broken front leg and the jawbones were broken several times. We tried to stabilise him but after one week we had to realise that his injuries were to bad and he has no chance to recover.This realisation is always very hard, no matter if you are in Europe or in India. In the second week, we had our first camp. It was in Kanyara, a little village about 30 minutes drive from McLeod, so we did not have to stay there over night. The people in this place were very friendly and helpfull and most of the times we had a cup of tea before work and also a delicious lunch. We worked there for one week, but I missed two days because of a bad headache. Anyway, it was a successful camp and we castrated many dogs, both male and female. To all dogs, we gave the rabies injection and also ivermectin against the mites. The locals also took the chance and came along with their pets, sometimes only for rabies vaccination but sometimes also for castrations. The third week started on Tuesday the 29th of september, because on Monday there was a Hindu holiday (Dushera). 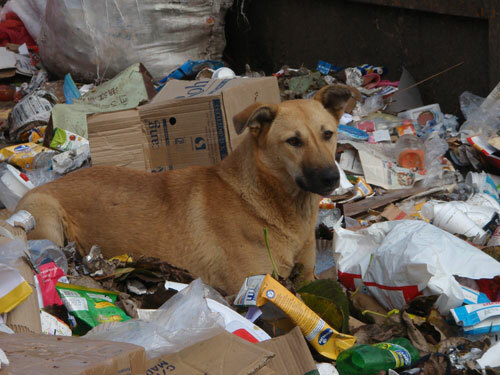 Originally the 28th is the world rabies day but because of the holiday we had to postphone this day by a day. At the 29th, there was a large gathering outside at the Tibet Charity house with many important guests, the chief guest was the private doctor of H.H. the Dalai Lama.So there were a few speeches and after that the private Tibet Charity dog got the first rabies vaccination and the rabies week was opened. The whole week, we drove around Mc Leod and Baksu and the other little villages around and vaccinated as many dogs as possible. Everbody of us had one job to do and my job was it to paint the dogs who had already been vaccinated. As a very nice side effect in this week we got around a lot and saw the areas and got in contact with the locals much more then a tourist would have had the chance to. All together we vaccinated in these days around 600 dogs, so I think this day and this week is a very important support for the fight against rabies. Maybe this week could be even more successful with a little bit more advertisment in the town few days before, because most of the locals are willing to do the vaccination but know less about the rabies problem. There was one adventurous event in this week, one day Liv recognized a dog with a strange behaviour. He was eating sand and was walking around totally restless. Bishnu caught this dog and because our sack had a hole, he got bitten. 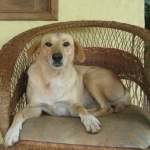 First we put the dog down and after that we organised the post vaccination for Bishnu. That was all very exciting because unlike in western countries in India rabies is such a real threat. In the week from the 5th – 9th of october, Liv left to Nepal and the two British girls had their last week. The whole week we had everyday a few castrations and the special event in this week was on Thursday because on this day there was a big thunderstorm and during a castration suddenly there was a power breakdown and we had to continue with the torch. Fortunately the surgery was almost finished so we did not have any serious problems. At the weekend I had to say goodbye to the British girls but they were displaced from a Norwegian couple, Jon and Solveig, who were also very nice and a personal gain to meet them. In the next week, the three of us did a lot of castrations without any special events. In this week there was again a gathering at tibet charity, because the founder of Tibet Charity Lakha Lama and some members of Tibet Charity Denmark visited Tibet Charity in Mc Leod. In last week with the Norwegians, we went to TCV Suja near Bir and stayed there over night to do castrations and vaccinations. This camp was not very successful, because the boys from the school wanted to help us catching the dogs but the most dogs were to fast and diappaered for the rest of the time. There were around 15-20 puppies but all to small for surgery. So the time there was a little bit uneffective but still the people were very nice and it is always interesting to meet and speak to Tibetans and listen to their stories. The last two days of the week, we had a lot of work in McLeod, on both days we did about 8-10 dogs with two of us because on both days either Jon or Solveig stayed at home. On Thursday we had a very special patient, some kids from upper TCV brought a Hanuman Languren, one of the 2 monkey species living in McLeod. This young monkey was bitten by a dog and was very weak. Our Profesor for wildlife animals Jon took care of him and cleaned the wounds and gave to him antibiotics and pain killer. The next day, the kids came again and the monkey was still very weak so I showed them how to feed him and how to give him something to drink. So I hope he is still alive. After that week I got sick and was resting few days in my bed. In these days once again I noticed the extrem compassion, kindliness and helpfulness of the Tibet Charity staff. The homenurses visited me regularly and took care for me. I felt really safe and not lonely at all. Already few days before I had decided to went to a meditation course over ten days and so after my convalescence I went to Tushita, a meditation center near McLeod, and had ten very intensive and informative days. For everybody, who will work at McLeod, I can highly recommend to take this chance to learn something about buddhism and about himself. After the time there, a friend and colleague from Germany visited me. We had one last working week together and on Monday and Tuesday we did a lot of castrations in the clinic in McLeod, but mainly young dogs because Bishnu had left Tibet Charity at that time so we missed this perfect dog catcher and had to take the easier ones. The last two days we were at TCV Suja ones again, but this time it was a almost perfect camp. On two days we did 26 dogs and all the former puppies are now castrated. Again the people there were very nice, we got very good food and good accommodation. After arriving in the evening in McLeod, there was the big good bye dinner with the director and the staff of Tibet Charity. In summery I have to say, I had a really great experience and certainly it won’t be the last time for me. I think, for the work in McLeod it is reasonable to have a little working experience as a vet, because than the help for the animal is much more effective but of course it is possible to deepen your skills there. The facilities in the clinic are definitly good enough to work there effective. The most needed thing is always the suture, so that is the thing everybody should try to bring when he is going to work there. A real enrichment is the contact to the people there, of course especially to the staff of Tibet Charity but also to the locals, Tibetan and Indian, most of the times you really meet nice, friendly, interested and interesting people. I want to thank Animal SOS Denmark, I am really really grateful for the benefit and I think it is a big support for every volunteer.